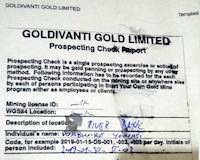 This is Prospecting Check Report near the area of Busia, Uganda. Every gold panning check is reported on the paper. That is how we collect the knowledge into the database. These are gold particles found on the beach of river Okame, near Busia, Uganda, as compared to the known coin size. Children are swimming in the river Okame, Busia, Uganda. This river is polluted by mercury from various spills of soil contaminated with it by mining operations. Uganda, as of 2019, still does not have any system or legal enforcements to contain the mercury. The one fine gold particle was found in river Okame, Busia, Uganda. The top soil does not contain much gold. This is Wabwire, our staff member and sluice operator, here on the picture he is gold panning on the river Okame, Busia, Uganda. The one pan prospecting volume is shown on this picture. This is Garrett Backpacker Pan filled with soil. When this exact gold pan is filled little bit below its hole on the side, the volume is just about 1.2 liters. By knowing the specific density of the soil, and by knowing the volume and actual gold prospecting results, we may know if the recoverable gold is profitable in the soil. That is field laboratory. The river Okame does not have the exposed bedrock, yet it carries gold particles from overburden soil, and from tailings that are constantly spilled into the river. It also accrues the mercury waste from mining activities. Basic gold prospecting practice can be done on the river. These are small gold nuggets directly from mother lode in Busia, Uganda. This is the engine used for rudimentary ball mill in Uganda, East Africa. This is rudimentary ball mill or "crusher" in Uganda, it is used for primary crushing and final milling. Capacity is only 100 kg per hour. This is rudimentary ball mill in Busia, Uganda. People tend to use very big balls inside for the reason that they do not use primary crushing properly. Thus big ball helps that rocks get crushed. No liners are used and such rudimentary ball mills are broken each in a while, they don't last in operation longer than just few months when they need to get repaired. Dusty environment and improper maintenance contribute to low efficiency. The capacity is maximum 100 kg per hour. This is ride on bodaboda, the motorcycle in Entebbe, Uganda. This is how the room and the bed looks like in Barconi Hotel, Entebbe, Uganda. This is Barconi hotel in Entebbe, Uganda. Bodaboda people are motorcycle riders, and bodaboda is motorcycle. They transport everything, from luggage to beds and coffins with dead bodies. Bodaboda transport is always available everywhere in East Africa. This is the bus station in Busia town, Uganda. This is how it looks like, the road is dusty, trucks are bringing ores to mineral processing places. This is small truck full of ore, we think it is loaded with about 2 tonnes of ore. It is called "one trip". One trip may contain from 0.50-1 grams to 4-5 grams of ore, if the ore have been taken from surface or represents overburden. If it is primary ore, it may contain 5-20 grams of gold and more. The Popular Mining Encyclopedia as issued by Action Mining, finally arrived to Uganda. I had to push the postman to go by motorcycle to Tororo city, and come to Busia, so that I can get the encyclopedia into my hands. It contains such powerful information and plans for gold mining and recovery equipment. I am fetching money from the ATM machine in Busia, that was nice hot day before my departure to Europe. 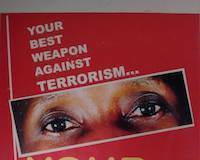 Your eyes are your best weapon against terrorism. Watch out, if you see anything suspicious report to authorities in Uganda. 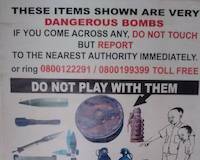 This is one of the warnings that we can find in offices in Busia, Uganda where authorities are warning against bombs. This is excavated open pit that was explored by artisanal miners some years before. Small number of miners are still working in this area and recovering gold every day. Majority of them abandoned the sites and went to new gold rush locations. The open pit behind me is possible gold mining opportunity that we may explore in soonest future. The buckets of concentrates are collected on the end of the day. The picture is dark for that reason that it was evening without light. These gold nuggets are magnified 10x in the gold pan. This heap of tailings was processed as of the day of publishing of this picture. This heap of tailings is being processed as of the day of publishing this image. Tailings are visible in background, heaps of tailings to be processed with our fine gold recovery sluices. One may see many tailings heaps in background. Each of them contains fine gold. One may see people working on this mineral processing site with tailings heaps in background. Well, those are ours. We process those heaps. This gold nugget is small and may be seen here in comparison to my finger. It was recovered by using special matting. Multiple nuggets were recovered, many of them coated with mercury in silver color and many of them as pure gold. This small gold nugget has size of 2-3 millimeter, and is magnified for 10x by using the jeweler's loupe and a simple mobile phone camera. It was recovered by using special matting on our sluice in Uganda. Mr. Louis is here preparing the sluice for work. Some key details are not shown on the picture, and are rather revealed to clients in the Start Your Own Gold Mine program. This is testing sluice whereby we are testing the capability to recover gold by at least 98% and where we are determining what else need to be improved for the actual sluice to be constructed. This is our sluice setup on January 11th 2018. We are definitely able to recover gold nuggets and fine gold particles. We always have administrative tasks to do, before, during and after the work. We record, measure, notify, obtain receipts, demand signatures, and do whatever necessary administration tasks. These workers are making outside furniture, or open-air furniture, the improvized benches, desks, and kitchen furniture. The mining camp requires such. We are using properly our technology to collect and separate black sand, that is what these boys are doing. They are classifying and collecting black sand.